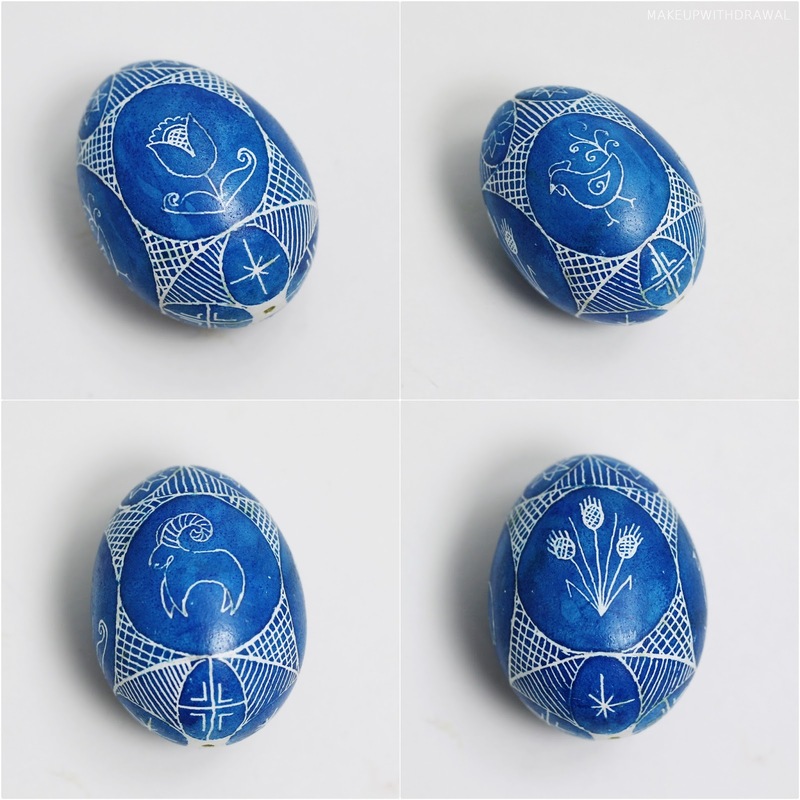 Recently I took up an old hobby, making Ukrainian Easter eggs (pysanky) by way of wax resist. I learned this in elementary school and I think the last time I dabbled in this was about a decade ago. This was the first egg I made. I was so rusty and it was so ugly due to my clumsiness and constant mistakes. I was ridiculously proud though of completing it though! I don't know if you know much about these eggs, but they are using covered in wax using a kistka which is a tool with a funnel at the end. There's electric kistkas these days but I use a manual one. Basically I scoop a bit of beeswax with the mouth of the funnel in the kistka, hold it near a candle and let the flame melt the wax. Using the finer end of the cone, I draw designs all over the egg. You dye various colors in order of lightest to darkest, adding wax in between to keep that color. Pictured above is Egg #2 after I've drawn the designs in wax. The blue stuff is also wax, just a refined wax that works in a finer kistka. Here's what Egg #2 looks like after I've colored it with blue dye. Here's what the finished egg looks like. After you've completed the dyeing process, you hold the wax covered egg by a flame and wipe the wax off as it is melted. At this point, I poke holes in the top and bottom of the egg, swirl a pin around and blow out the yolk and egg white so that the egg is hollow. Egg #3. Remarkable improvement over Egg #1, no? Anyways if you're interested, this website goes over the basics and tools needed for this interesting craft. Do you have any unusual hobbies or crafts you like to do?